Toby C. Campbell, MD is a member of the University of Wisconsin Carbone Cancer Center as an associate professor of medicine within the hematology-oncology section of the UW School of Medicine and Public Health as well as chief of the Palliative Care program and program director of the Palliative Care fellowship training program. 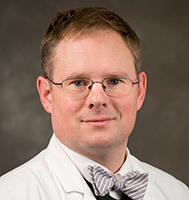 Dr. Campbell received his medical degree from the University of Virginia and completed his internal medicine residency at the University of Wisconsin Hospital and Clinics. He recently completed fellowships in medical oncology and palliative medicine at Northwestern University. Dr. Campbell's clinical practice interests are in Lung Cancer, symptom management, communication and Palliative Care. His clinical research interests are in lung cancer therapeutics, chemotherapy-induced peripheral neuropathy, symptom management, and interdisciplinary medical teams. He is a member of the American Society of Clinical Oncology, American Association of Hospice and Palliative Medicine and the American Association for the Physician and Patient. Dr. Campbell is part of the Lung Disease-Oriented Working Group, through which multiple clinical trials in lung cancer are helping to find better treatments for those with cancer. His research interest is lung cancer therapeutics, including early phase clinical trials, and the management of chemotherapy-induced peripheral neuropathy.